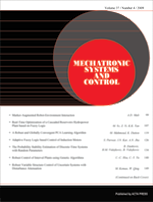 This international journal publishes both theoretical and application-oriented papers on various aspects of mechatronic systems, modelling, design, conventional and intelligent control, and intelligent systems. Application areas of mechatronics may include robotics, transportation, energy systems, manufacturing, sensors, actuators, and automation. Techniques of artificial intelligence may include soft computing (fuzzy logic, neural networks, genetic algorithms/evolutionary computing, probabilistic methods, etc.). Techniques may cover frequency and time domains, linear and nonlinear systems, and deterministic and stochastic processes. Hybrid techniques of mechatronics that combine conventional and intelligent methods are also included. Please add $50 for postage and handling to Canada & USA; $95 for postage and handling to International destinations.